Kristen and Francisco met in Utah. They knew they wanted to marry in the mountains that they loved spending time in when they were dating. While planning their wedding they had relocated to Costa Rica for work. Park City was special to them so they spent time planning from afar. Kristen and Francisco had chosen Park City Mountain Resort for their celebration. They loved how the resort offered a quintessential mountain experience for their guests, many of which were traveling to attend their nuptials. Both Kristen and Francisco spent the morning getting ready in old town Park City. They chose to do their first look on the town lift bridge just off Main Street. The weather report had been threatening rain and snow leading up to their wedding day. It was quite chilly for their photo session but the sky was kind and did not open up until later that day. It actually ended up snowing and created a winter wonderland for their guests to enjoy from inside the cozy reception lodge. This image was taken on the ski run that leads into town. The fall colors were just beginning to show in the hills behind them. 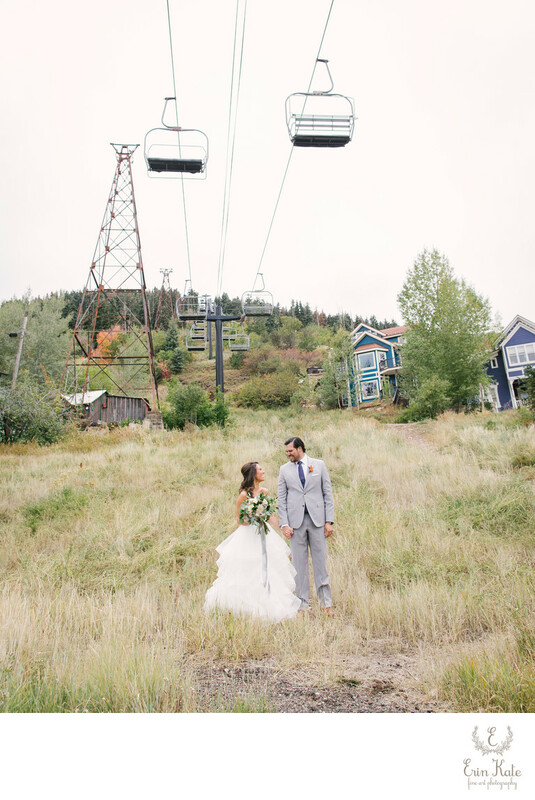 The chairlift above was the perfect backdrop for their ski resort wedding. We then continued with photos that included their bridal party before heading to Park City Mountain Resort for family formals and their ceremony. Location: 825 Main St, Park City, UT 84060.